Culms: Ascending to spreading from decumbent base, solid above, often hollow below, smooth, somewhat flattened, branching at base and lower nodes; sometimes rooting at nodes. Blades: Flat, to 9 inches long, 1/8 to 1/4 inch wide, surfaces and margins rough, sparsely long-hairy; tip tapering to sharp point. Sheaths: Shorter than internodes, slightly keeled, smooth, few hairs often at throat. Inflorescences: Panicles, terminal; branches 6-20, crowded, finger-like, erect or ascending, 2 to 3.5 inches long, pale green or tan, silky. Spikelets: 2-flowered, flattened, crowded on 1 side of slender branches; lower floret fertile; upper floret underdeveloped; glumes unequal, 1-nerved, tapering to points; lemma of fertile floret swollen, hairy at base, margins conspicuously fringed, awn rough, 1/8 to 2/5 inch long; underdeveloped floret with awn 1/10 to 1/3 inch long. 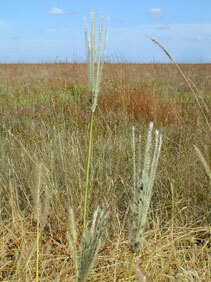 Habitat: Pastures, disturbed prairies, roadsides, waste ground; sandy soil. Distribution: Principally south 1/2 of Kansas.